Focus: When contemplating a loan, consider a lender who has a history of focusing on the type of loans you need. There are many lenders out there who target many different types of loans. This lack of focus could cost you both time and energy in the short-term. In the long-term you could find that their lack of focus keeps them from understanding what’s most important for insurance agency owners like you. That lack of focus and understanding can cost you both time and money. Capabilities: Your financing needs may be simple and relatively easy to satisfy now, but in the future, you could need more sophisticated financing. It’s important to align yourself with a lender who with broad enough capabilities to serve a wide range of lending needs, both current and future. 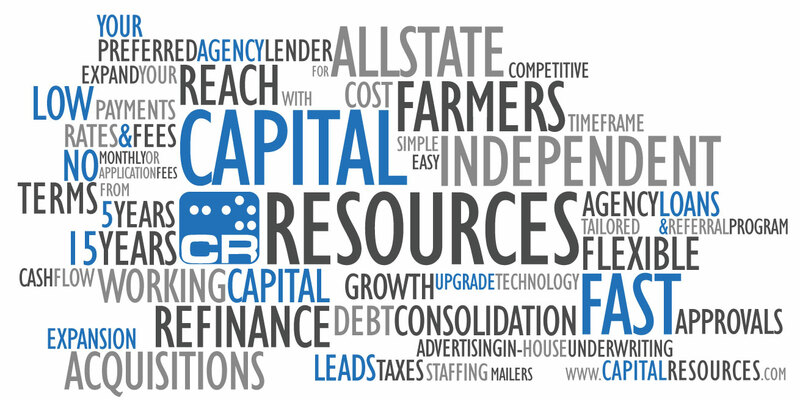 Resources: A successful agency may grow more rapidly than you expect, and the need for financing support will expand with the business. Your growth should not be limited by your lender’s size, lending limitations or lack of knowledge about your business. It’s important to choose a lender without subjective lending limits and one who celebrates your growth with you. Balance: You’ll want a lender who can consider your total picture, including all your agency’s assets and potential. A lender with an in-depth understanding of your agency can look past temporary aberrations to make informed decisions. Flexibility: It is also important to align yourself with a lender who is flexible enough to adapt to your needs, not one that asks you to adapt to theirs. One should not have to settle for a one-size-fits-all approach that, in the long-run, may inhibit your growth. Consider a lender that can meet your needs by being able to think outside of the traditional lending “box” that is often defined by. Commitment: The movement of interest rates and the relative health of market sectors can make lenders eager to offer cash one moment and reluctant the next. You want a lender committed to supporting the small-to-midsize business market, regardless of the fluctuating economic climate. There are many considerations when choosing a loan. One of the biggest of which is who you obtain your loan from. By taking the time to evaluate the lender you may find yourself with a lender who can assist you today and for years to come.